SCVHistory.com | General Interest | Perkins-Lamkin SCV History Images Come Home, 9-17-2017. Perkins-Lamkin SCV History Images Come Home. SCVHistory.com | Sunday, September 17, 2017. Terrel Metheny of Riverside found what proved to be the photographic copy of the A.B. Perkins Collection of SCV History in an estate sale in the city of Orange. Update: Dozens, perhaps hundreds, of additional documents and photographs from the Ted Lamkin estate, which were never part of the Perkins collection and were previously unknown, were acquired October 19, 2017. In a serendipitous case of "what goes around, comes around," the "borrowed" set of images that launched the SCVHistory.com archive 21 years ago is home again — because of SCVHistory.com. I'll explain. One day in 1996, a box showed up on the doorstep of Ruth Newhall's Piru Mansion. Ruth called me, knowing I would want to use its contents. Inside the box were 35mm negatives. Lots of them. About 1,100 of them in total. They were the entire A.B. Perkins Collection of historic Santa Clarita Valley photographs, as the collection existed in 1963. Ted Lamkin had photographed the old, in some cases deteriorating, pictures that Perkins had collected over a lifetime. The box held the negatives Lamkin made. 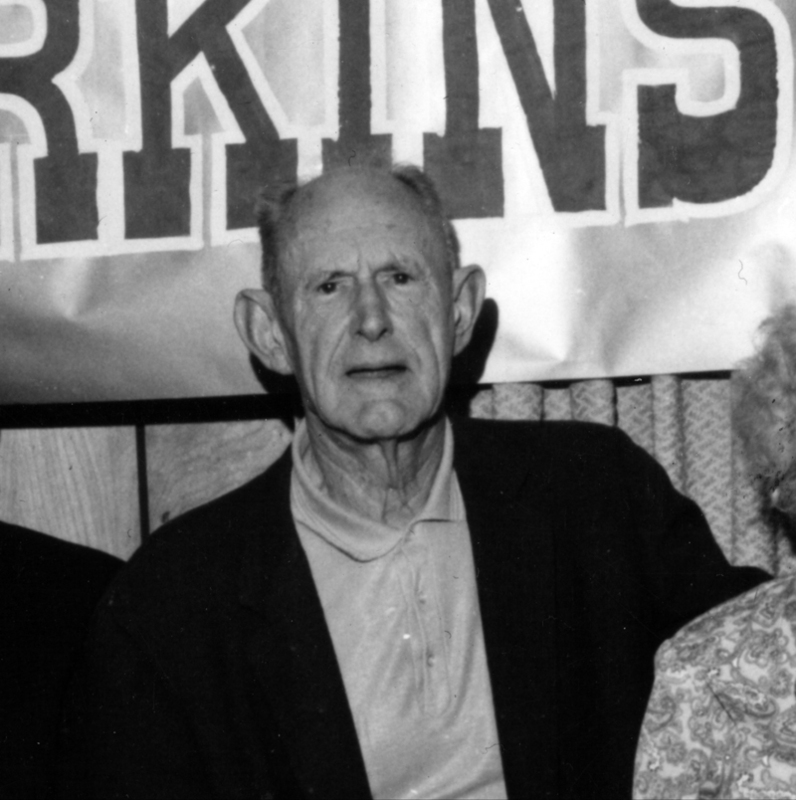 Arthur B. Perkins. Click for more. By way of background, Arthur Buckingham Perkins was the Santa Clarita Valley's first "town historian." Known as "A.B." or "Art" or "Perk," he came to Newhall in 1919 to run the then-private Newhall Water Co. and stuck around until his death in 1977. In between he wore many hats — we were a really small town back then — local judge, home builder and, to posterity's benefit, collector and writer of SCV history. Fred Lamkin was Newhall's Chevrolet dealer in the 1930s-40s-50s. Exactly how it is that his son, Louis Theodore "Ted" Lamkin (1917-2007), came to photograph Perkins' collection in the early 1960s, I don't know. I just know Ted Lamkin was into photography. Back to 1996. I borrowed the negatives under the proviso that I had to return them to Ruth so she could return them to Ted. I took them to a photo lab and made two sets of prints. One set I gave to the Santa Clarita Valley Historical Society. The other set I kept and used, both in print and to start "SCV History in Pictures," aka SCVHistory.com, on this thing some folks still couldn't wrap their heads around — the World Wide Web. (To put the freshness into perspective, two years later, Google started in a garage in Menlo Park.) Then I returned the negatives and never saw them again. Until Sunday, Sept. 17, 2017. On Friday I got a message through this thing some folks can't wrap their heads around — Facebook. Terrel Metheny is a commercial painter by trade. He lives in Riverside and likes to shop at estate sales. 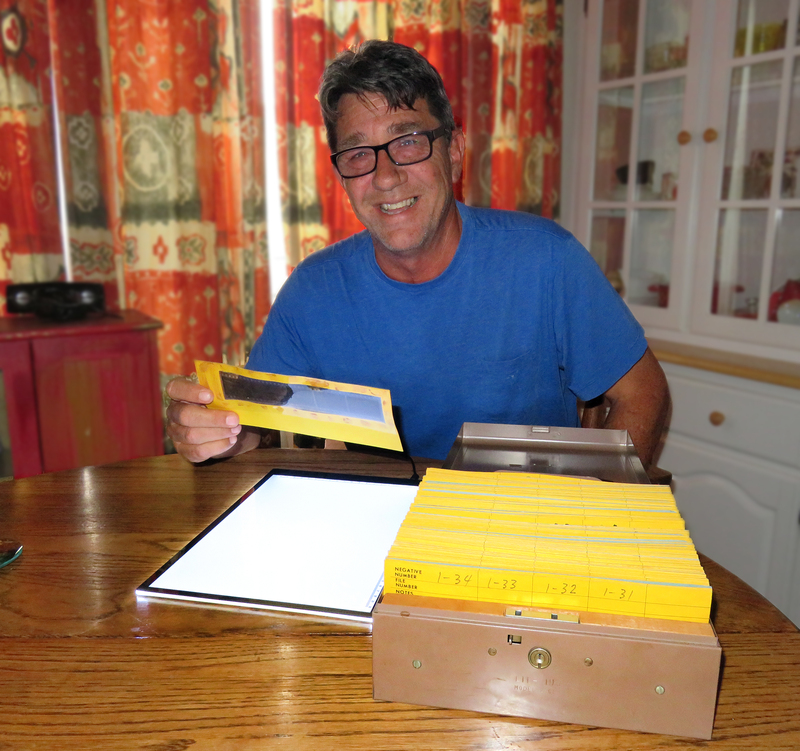 A couple of days ago he bought a box of negatives at an estate sale in the city of Orange. They looked like interesting old pictures. He Googled the name he saw on the negative sleeves — A.B. Perkins — and landed on SCVHistory.com, where he found a story about the negatives I wrote 21 years ago. I called the firm that handled the sale. Sure enough, the name associated with the estate was Lamkin. I connected with Metheny on Sunday. Once the negatives are scanned — something not easily done in 1996 — they'll be placed in a fireproof safe and secreted inside the disaster-proof bank vault at Santa Clarita City Hall. (City Hall was originally a bank building. The vault is still there.) The scans will be ever-so-slightly crisper than the derivative copy prints we've been using for the past two decades. Of course, SCVHistory.com has grown 100-fold from those original 1,100 images, thanks in part to "locals" who continue to share their family photos — just as Newhall and Saugus and Castaic and Acton residents shared their family photos with Art Perkins back in the day. (There was no Valencia or Canyon Country then.) A team of talented volunteer researchers and (now) daily acquisitions keep our knowledge of Santa Clarita's past on an upward trajectory. What of Perkins' original prints, you ask? Jerry Reynolds and friends formed the Santa Clarita Valley Historical Society in December 1975, not long before Perkins' death. By that time, Reynolds had assumed the mantle of (our second) town historian. Perkins gave his original collection to Reynolds, who made it available to the Historical Society and used it for several series of articles he penned in The Signal during the 1970s-80s-90s, just as Perkins had done in the 1950s and '60s. The collection grew under Reynolds' stewardship. On his deathbed in (coincidentally) 1996, Reynolds gave the bulk of the collection to historian Philip Scorza, producer of the local history series on SCVTV, "Points of Interest." Reynolds had been a frequent guest on the show in 1994-95. Scorza then donated the photographic prints to the Historical Society. Some readers will recall a "Perkins Collection" at the Valencia Regional Library when it was part of the Los Angeles County Library system. I don't know what happened to it after the Valencia Library came under city control in 2011 — the collection was county property — but it was not unique material. It consisted of copies of materials that exist elsewhere. It's a similar situation with the Lamkin negatives. After 21 years, they aren't likely to tell us many more new stories. They are the story. The "most original copy" of the early Perkins Collection is here to stay for future generations.